Camp High Hopes held a Volunteer Recognition Banquet on Feb. 27th recognizing all who have volunteered in 2013. Volunteers are a critical part of our camp’s operations and allow us to provide recreational services to individuals with disabilities. Volunteers bring life experiences, skills, abilities, compassion, intellect and humor and ask for nothing in return. At the close of our first full year of operations in 2013 we decided we would not only like to have a special day to honor and thank our volunteers, but we would also like to implement an award where one volunteer each year would receive a special honor. This award would be given to the volunteer that stood out among all of our amazing volunteers in that year. We are forever grateful for EACH of you for the time and talents that you have shared! To the world you may be one person but to one person YOU may be the world! With over 200 volunteers to choose from it was extremely difficult to choose just one as our 2013 Volunteer of the Year. We are honored to announce PREMIER BANKCARD as the 2013 Volunteer of the Year! Premier Bankcard had multiple representatives from their company volunteer at the camp’s key events in 2013, including our BBQ Sale, Fall Open House, One Year Anniversary, and our Haunted Lodge Party. Premier Bankcard was not only committed to volunteering for our organization, but they always did so with a big smile and a lot of excitement, always asking what was next that they could help with! 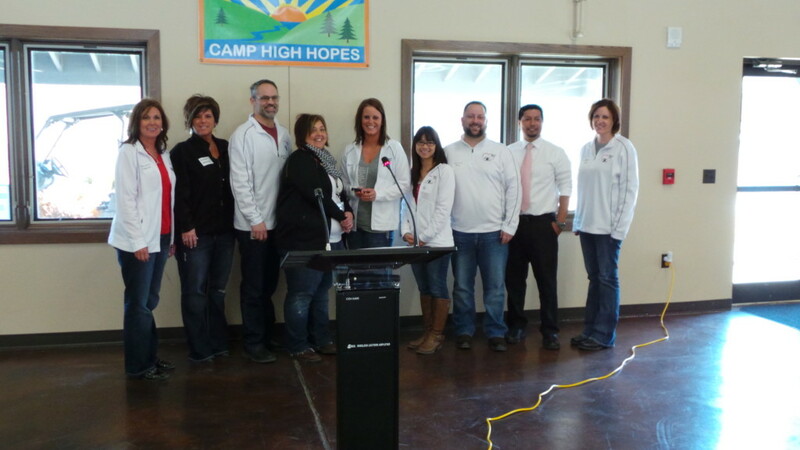 Congratulations Premier Bankcard as being named Camp High Hopes 2013 Volunteer of the Year!! !